As y'all probably know, even though the rest of the world has already put away their One Direction Easter Baskets, and Walgreen's has put Cadbury eggs on 75% off clearance, we here in the Catholic world are still partying hard because Christ is risen!. Each day of the Octave is a solemnity, each day is like Easter Sunday itself. Awesome, right? If you've noticed, I am a big fan of numbers (e.g. Seven Last Words Reflections, Five Reasons I'm Excited for the New Translations), so here comes another numbered list. Just as we continue through the Easter Octave, in honor of the continued jubilation, I put together 8 Facts about the Octave. 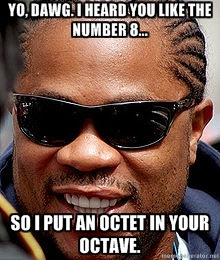 Yes, that's right, I am putting an octet in your Octave. So begins this list that includes fun topics like baseball, Disney movies, and shopping - 8 Facts For The Octave. Hit the jump for all 8 facts. Okay, we'll start this list off with some basics. Mr. Adam Sandler, although Happy Gilmore remains one of my favorite guilty pleasures, I can't let you get away with claiming that our Jewish brethren are the only ones who celebrate for 8 days. No, sir - we Catholics party hard as well, and we can see this 8 day party highlighted in the liturgical celebration throughout the Easter Octave. You see that? It says "on this day." This means that even today, Wednesday, for Catholics isn't really Wednesday (try telling your boss or teacher that). Nope, today is like Easter Sunday itself. Today we celebrate the glory of the Resurrection even when the world won't. 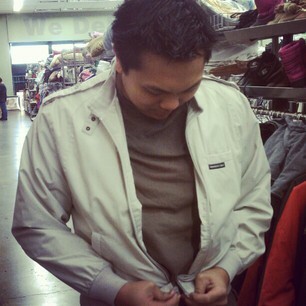 Check out JP's new Member's Only jacket he bought last Easter - $2 and some change at our local thrift store. Alright, I'm not trying to get anyone in trouble here, so I'm not saying you need to go on a shopping spree, but there is a beautiful tradition of buying new clothes for Easter. Why? It represents the idea of putting on a new life in Christ. Get it? Put on a new life, put on new clothes. Think about the Easter vigil. The Christian initiates put on new white clothes after they were baptized. In fact, the old tradition was that Christian initiates would receive a white robe upon their baptism and they would wear it for the entire week of the Octave. An entire week - to school, to work, out to dinner, while riding horses. They would only take off these symbols of their new life on the following Sunday - this is why this Sunday used to be called in Latin: Dominica in albis depositis. So, there you go, that's the deeper meaning of Easter clothes. Now, that's why there's an old Irish saying that goes: "For Christmas, food and drink; for Easter, new clothes." I mean, I would say: "For Christmas, food and drink; for Easter, new clothes... and food... and drink," but you get the point. I apologize for the ridiculous image choice. Here's one for all my fellow folks who are digging the return of baseball season. "It is supposed that ball-tossing had a deep symbolical meaning when played in the spring of the year; and that the tossing of the ball was intended to first typify the upspringing of the life of nature after the gloom of winter. 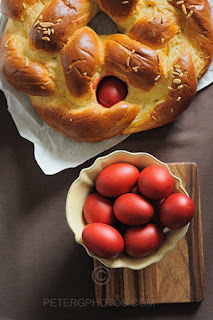 And, whether this was the case among the people of antiquity or not, it is a remarkable fact that the ecclesiastics of the early Church adopted this symbol and gave it a very special significance by meeting in the churches on Easter Day, and throwing up a ball from hand to hand, to typify The Resurrection." 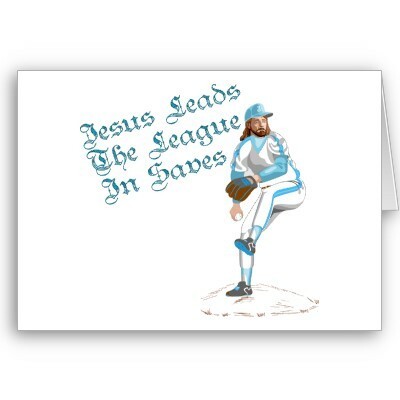 Every time you see that ball fly through the sky, remember the Son who rose for your sake. Also, Lent's over so go eat a Ballpark Dog (or five). There has been a long-standing tradition of a special greeting that people have used in many different cultures around the world to greet each other during the Octave. This Paschal Greeting differs from culture to culture and there are even variations within a culture. The traditional greeting in Latin would be "Christus resurrexit!" which means "Christ is risen!" Now, the response takes usually one of two forms - either "et apparuit Simoni, Alleluia!" which means "and He appeared unto Simon, Alleluia!" or "resurrexit vere!" which means "He is risen indeed!" Check out how cool this practice was before. People used to answer their phones with this greeting. People would answer their doors with this greeting. I say, let's bring the practice back! Imagine including this greeting in all of the emails we send. Imagine if this greeting trended on twitter for the whole Octave. Christos Voskres! - Christ is Risen! Voyistynu Voskres! - Indeed He is Risen! Hristos a inviat! - Christ has risen! 実に復活！(Jitsu ni fukkatsu!) - Indeed the resurrection! 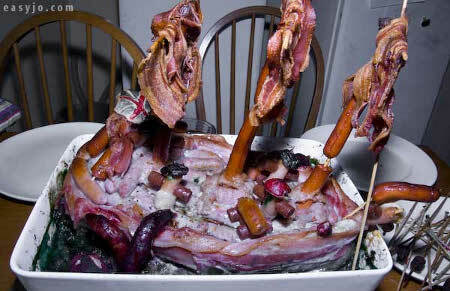 Yes, that is a pirate ship made of meat. Most Catholics in the know understand that all Fridays throughout the year (not just Fridays of Lent) are days of penance, and thus are days when abstinence from meat is prescribed (CIC 1250-1251). In the US, our episcopal conference has provided for the option to substitute some other form of penance. That means no meat this Friday, right? Or this means some other form of penance, right? Because this Friday really isn't a Friday. It's like Easter Sunday. And per Canon 1251, since Friday is a solemnity, we need not abstain from meat, and even more forcefully, we should not abstain from meat. Feasting, not fasting, y'all. Celebrate the joy of Easter. 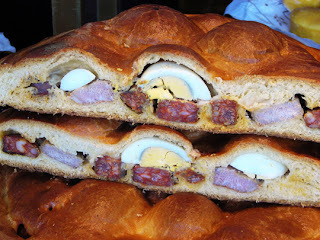 Given this, the Friday within the Octave of Easter has been a day where Catholics joyfully embrace all that is meat. So, eat some meat this Friday! Or if you practice Facebook Fridays, feel free to go on a photo tagging spree. 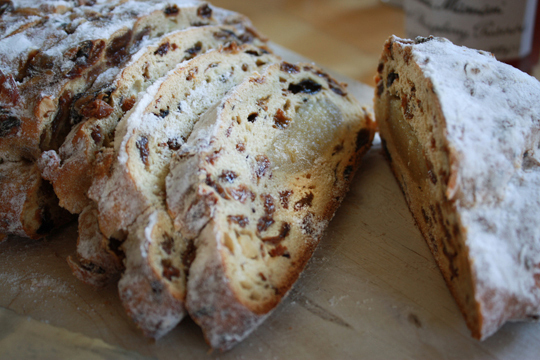 Or if you are ambitious enough – aaaarrrgh! – get together with some friends and enjoy the deliciousness of a pirate ship made out of meat (pictured above). Everyone's favorite hunchback owes his name to the Easter Octave. 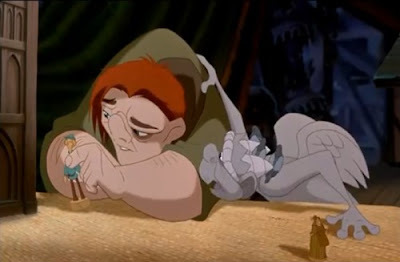 You see, the name Quasimodo comes from the Latin text of the traditional introit for the Octave day of Easter - the same day that Quasimodo is laid on the steps of Cathédrale Notre-Dame de Paris in Victor Hugo's tale. The introit begins with: “Quasi modo geniti infantes..." ("As newborn babies...", from 1 Peter 2:2). So on Sunday, it would be apropos to stuff a pillow down the back of your shirt, climb a tower, and ring some bells. Er, just don't push anyone off said tower, that wouldn't really be an act of Paschal love. If you made it out to Mass today, you would have heard the account of the Road to Emmaus. Without getting into the story too much – if you want, you can read it yourself, Luke 24 – there's a beautiful account of the breaking of bread. 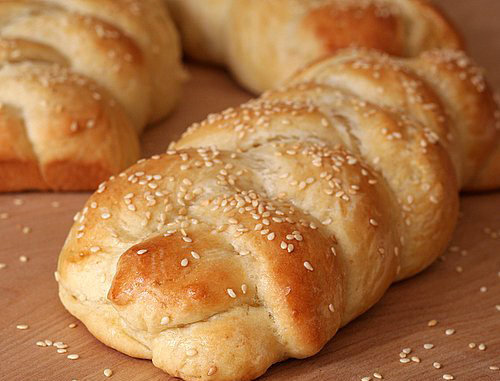 Bread is important to us, y'all. O Lord Jesus Christ, Bread of the Angels and Living Bread of eternal life, deign to bless this bread as Thou didst bless the five loaves in the desert: that all who taste it may receive health in body and soul. Thou who livest and reignest unto endless ages. Amen. #8 - Why so serious?! Hopefully throughout this week you have experienced the Easter joy spread throughout our Christian brethren. Joy - that's what it is about. This isn't a new theology. Even the early Church Fathers understood this joy, calling the period after Easter the Risus Paschalis, or the Easter Laugh. Why laugh? Because Easter is the triumphant joke played on the Devil. At Christ's death, the devil thought he won, but on Easter it was God who was in fact victorious. The devil got punk'd, if you will. In celebrating this Easter joy, many cultures have traditions of pulling pranks on one another during the Octave. Several European cultures celebrate some form of a drenching tradition similar to the Polish Smingus-Dyngus day. On that day, Easter Monday, boys go around drenching girls with water, and vice versa. So, don't take this week too seriously. Christ is victorious, have some fun*. Well on that note, so ends this Easter Octave octet. However, more days remain of the Octave, brethren, so keep on partying, go shopping, ring some bells, eat some meat, and pull some pranks*.